I recognized it right away, even though I hadn’t seen it in years. It was my mother’s missal. Mike was leading a tour of our family print shop for a special dinner Steve and I were catering on the rooftop that night. Good friends of ours had purchased this sweet package at a silent auction. It included the dinner on the roof with a great view of the fireworks that 100,000 or so people had crowded downtown to see that Thursday night. It also included a ride on our 100-year old freight elevator (possibly one of the three oldest in Omaha) and a tour of the plant and building. We were upstairs in the space over the old offices, which at one time in the early history of the building (before our family owned it) was the home of a prostitute. It has laughingly been referred to as “the whore’s nest” by more than one generation of family and friends. We always used it for storage, and a couple of years ago we emptied it out as we thought we had a buyer for the building. I hadn’t been up there since that day. And that’s where I saw it, mom’s missal. It was on top of a small pile of family possessions that managed to survive our cleaning mission. It’s white vinyl cover now dirty and darkened by time, I knew what it was instantly. “It’s mom’s missal,” I said aloud mostly to myself, but others heard. “You were meant to find it today!” said my friend Chris. I had just told her that this day, July 2, 2015, had been my last day on the staff of the Presbyterian church I have served for the last thirteen and a half years. I picked it up and carried it back downstairs for further review at home, and then we proceeded with what was a really fun night up on the roof. This past Monday, since I am now unemployed, I took some time to just quietly thumb through the pages, remembering how it looked it my mom’s hands as she followed the mass on Sundays at Christ the King Catholic Church. It is The New Marian Missal for Daily Mass by Sylvester P. Juergens, S.M., doctor of sacred theology (the new large type edition), published in May, 1961, by Regina Press of New York. I tried Googling it and found that you can still pick up a copy on Ebay, for about $4. There were many hits for this particular missal, so it must have been popular. At nearly 1500 pages, it contains the masses for all the holy days, all the liturgical seasons, ordinary time as well. There is a full list of saints and their feast days, and you can also find the masses for those days. Since it was published in 1961, it is a Latin missal with English translations on the opposite page. If you didn’t know Latin (other than the most common prayers like the Nicene Creed and the Lord’s Prayer), you could still follow along with the priest as the words were said and know what they meant. And that was and is the whole purpose of the missal: to be an active participant in the mass and not just an observer. I have tried to explain this to a number of my reformed church friends who make the most amusing but uninformed comments about the Roman Catholic mass. Its liturgical calendar at the front of the book includes dates from 1961-1980, so this was meant to be a tool for worship for the long term. It has five now faded color ribbons to mark the sections as you moved back and forth depending on the season. I think I remember those best of all because when I could get my hands on this as little girl, I would move them back and forth among the pages to mark the colorful plates that illustrated biblical scenes like Jesus riding the donkey into Jerusalem on Palm Sunday. The back of the book has a name plate indicating that it is my mom’s. 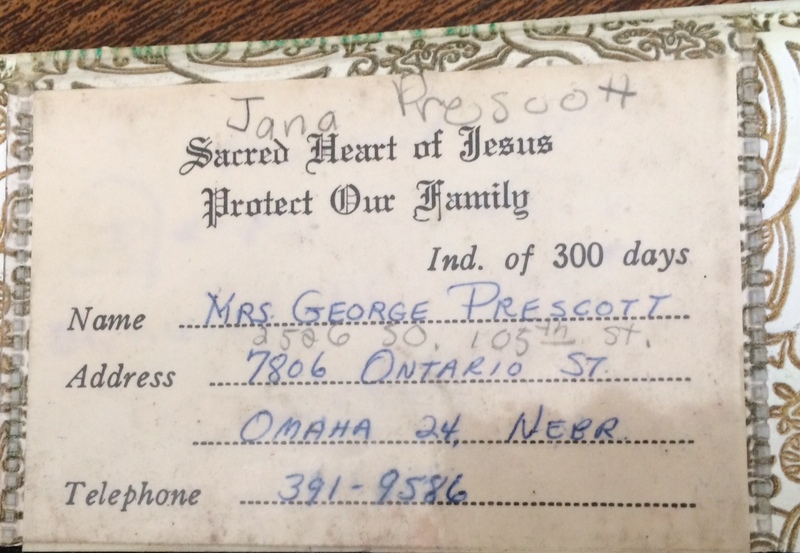 In her very neat printing in blue ink it says: Mrs. George Prescott, 7806 Ontario St, Omaha 24, Nebr, 391-9586. A later addition in pencil has this corrected to: Jana Prescott, 2526 So. 105th St. Jana must have appropriated it sometime after we moved in 1965, and Mom died in 1966. And I stop right here and remember both those places. My dad built the house on Ontario Street in 1958. He moved the then small family of Mom and George, Jr. and Jana to that house where I joined them in December that year when I was born. In the fall of 1965, our family that now included Susan, Mike, Sally and Cathy, moved to the house on 105th Street. We had the same phone number, 391-9586, and the same ZIP code, 68124. The house was not much bigger, but Daddy had a small addition built on that gave us one more bathroom, one more bedroom, and a big dining room. I can still see my mom washing dishes at the sink or cooking at the stove, the old yellow telephone tucked under her ear as she kept up with family news while talking to Aunt Tillie or Grandma Thirtle, the phone cord stretched out to its full length, which always seemed like about fifty feet. 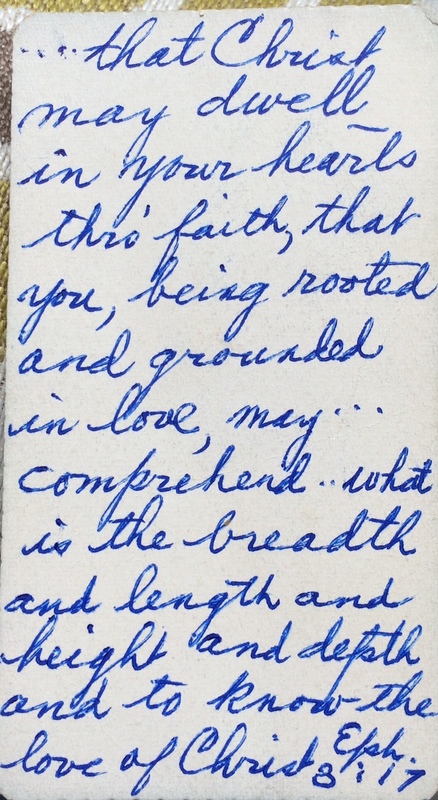 As I paged through the missal I found prayer cards that Mom had tucked in there. Favorite Bible readings. The 23rd Psalm. The Beatitudes. Easy references for scriptures that spoke to her heart. There were other picture cards as well. 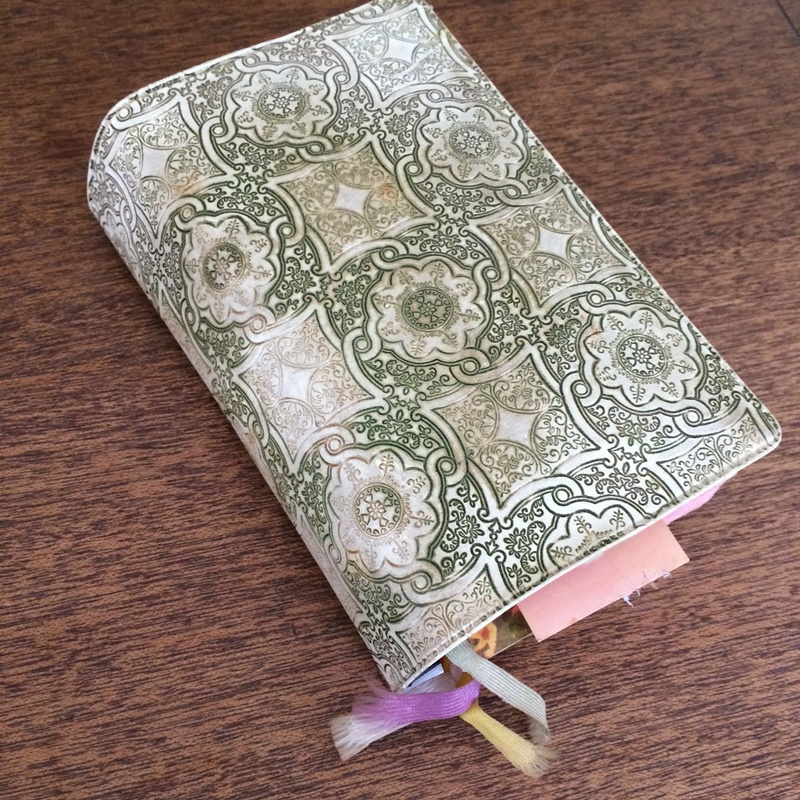 When I turned them over to see the back, I found scriptures written in her handwriting. She must have written them out to keep them close by, handy in a book she probably used every day. And I too, love this one from Ephesians, as it uses the words that describe the dimensions of the cross to remind us just indeed how great the love of Christ is for all of us. I turned to the section where I knew I would find the prayer that is so much on my heart these days, the Agnus Dei, a reminder of why I am folding all those paper cranes. The words are there for the ordinary mass and also for a funeral mass like the one that was offered for Mom after she left us on March 27, 1966. Dona eis requiem, dona eis requiem, dona eis requiem sempiternam. Grant them rest, grant them rest, grant them eternal rest. There are so many days nearly fifty years since she died, that I miss my mom. I wonder what she would think of what her children have grown up to be and to do. I like to think she has smiled down at us as we have experienced love and joy, and that she has wept a mother’s tears at our failures and our sorrows. I know she has marked our lives by her love and her faith, and I am so grateful for what she passed on to me that is so important to my life and my journey. Finding that missal in the whore’s nest on a July night in Omaha, Nebraska, with fireworks blasting and lighting up the night sky, felt like a sweet kiss blown my way from heaven. It was as if she was telling me that even though my time on the church staff has ended, my journey of faith has not. My work on earth is not done until I am called home like she was. I have good news yet to hear, and good news yet to tell. I have travels left to make with the living Christ in Lebanon, in Syria, in Iraq, places where other mothers and fathers are marking their children in the same way mine have marked me. And so I will keep going. What an awesome find. I love seeing her handwriting and especially the printing in all caps! You make her real for me, when I cannot find any memories of my own. It is amazing to me how such a finite piece of matter can spark a memory, and yet it does. Some day my brain and/or my heart will probably explode for the sheer amount of memory they contain. Until then, I will continue to tease them out so I can share them with you and the other Prescott siblings who should know. She was a praying woman. She was a woman of deep faith. I am thankful that those threads of her being are still a part of her children who remain.